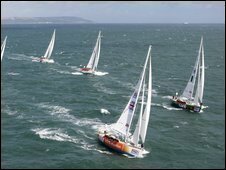 The start of the Clipper Round the World Yacht Race and the Freedom music festival generated £9.3m for Hull and East Yorkshire, a report has found. The departure of the yachts on 13 September and the live arts and music festival in Hull over the same weekend brought 150,000 people to the city. The analysis was carried out by Glasgow Caledonian University on behalf of Visit Hull and East Yorkshire. The tourism organisation described the events as an "overwhelming success". The report found the events attracted people from as far afield as Germany, Iraq and Australia. Visit Hull and East Yorkshire said the Freedom festival had proved so popular it would now become an annual event. Its chief executive Janet Reuben said: "The Clipper and Freedom weekend was spectacular and has shown this city the enormous capacity it has to host world-class festivals. "The unprecedented success of the events, in both attracting visitors to the region and supporting local businesses has created a strong feel-good factor that will make future festivals even better."